The D1 is a premium 24-bit DAC and headphone amplifier for your computer, TV, and more. The D1 accepts inputs from both USB and optical and has outputs for any audio system or headphones. The D1 DAC is the perfect way to get great-sounding music not only from your computer but from your TV, Apple TV, Blu-ray player or CD player. DirecTV and Comcast also have optical outputs for high-res audio. Setup is easy and no special software, app, or driver is needed, making D1 a true plug-and-play digital audio solution. 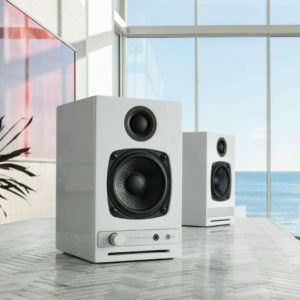 The D1 reflects traditional Audioengine design and the audio fidelity is typical of Audioengine’s commitment to great sound at an affordable price. 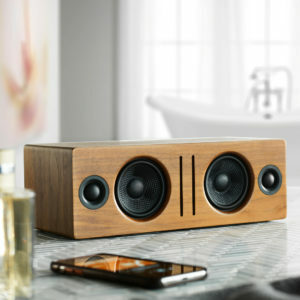 Even if you’re not an audio enthusiast we guarantee your music will sound better! 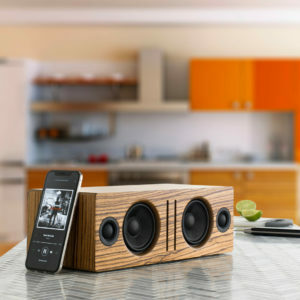 The D1 is a USB Plug-and-Play audio device. which means that the drivers it uses are developed and provided by the developer of your computer's operating system. Because of this, you shouldn't need to download or upgrade any drivers to use your D1. When you connect an optical cable, the D1 will sense that an optical input is present and give that input priority. If using D1 with optical outputs from your TV, DVD player, Apple TV, etc you will need an AC USB power adapter (sold separately) to power D1. When using the optical output from your computer, you may power D1 via the computer's USB power and therefore no external power supply is needed. What volume level should I set my D1 and/or speakers to for the best results? There's not really a right or wrong when it comes to volume settings. I'd recommend setting it up whichever way is more convenient, and dialing in a combination of settings to give you the smoothest ramp-up. If you intend to use the D1's volume as your main control for example, try this: set the speakers to zero volume, and the D1 to max volume. Then with music playing, adjust the speakers up until the volume is as loud as you would want to listen to it. Then simply adjust from the your D1 to mood. 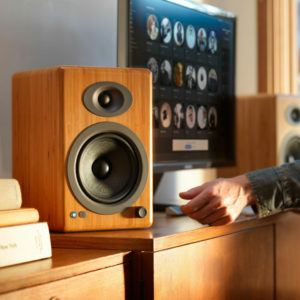 To get things up and running, you would just need to first connect the included USB cable from your computer's USB port to the D1; then you'll need to connect the RCA outputs to your powered speakers/ AV receiver or your headphones to the headphone output on the front of the D1. Next, if using a Mac, you will need to go to System Preferences/Sound, and select "Audioengine D1"; if you're using a PC, no setting changes are needed as the computer will automatically find the USB driver. Finally, you'll just need to play music from iTunes or your favorite media player and that's it! Setup really is that easy! The D1 is essentially a very high end external sound card. Its components and implementation of those components make it more capable than what might be built into a computer, not to mention the benefit of moving those sensitive components outside and away from the potentially noisy interior of your computer. All of this means the signal your speakers receive will be clearer, with a lower noise-floor, and with a more pronounced dynamic range over your internal sound card. Yes! You will need an Apple USB 3 camera adapter. What you would need to do is connect the D1 and its USB cable to the USB A port on the Apple USB 3 camera adapter, and then the male lightning end of the Camera Adapter to your iOS device. You will also need to have a power supply that can power enough to the D1 and your device. Apple's USB C Fast charger is recommended for this. Will the D1 work with my low-impedance headphones? The D1 includes a headphone amp based around the TI OPA2134 low noise opamp. This headphone amp is able to provide low-impedance, high-fidelity audio to a wide range of headphones and supports headphones with impedances 10 ohms and higher. Should I be using the optical or USB input on my D1? Both USB and Optical should provide the same high-quality digital signal to your D1. In most cases where both USB and optical are available, we usually recommend USB since it's a shorter signal path. The only real difference is that the optical input on the D1 can support up to 192KHz input if your source supports it. We'd certainly recommend trying both if you have them available to see if you can notice any difference in your setup, and with your audio files. Can I send audio to both the optical and USB inputs at the same time? The Optical connection on the D1 takes priority, so when the D1 receives an optical signal it will switch to this automatically. Some devices will deactivate their optical out when no audio is playing. Others will leave it active and send an empty signal when no audio is playing, meaning depending on how the optical output on that source acts you may have to shut the source off. You can use something like an optical switcher so that you can toggle between the optical source and the USB input. If using a Mac, open the Audio MIDI Setup utility in Applications->Utilities, under Audio Devices, choose "Audioengine D1" and check that the format is set to 96 and the bit depth is set to 24bit. On a PC, open the sound options through the control panel. 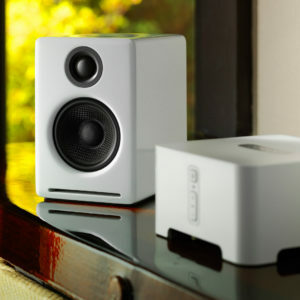 Then choose Speakers - Audioengine D1" and select Properties. You can select the output format from the dropdown in the advanced tab. Is it normal for the D1's USB cable to be loose? It's normal for USB B connections to have a little play as well as some of the metal to be showing when they are plugged in, so no need to worry. It will be fully connected once you feel and hear the click noise from the connection.